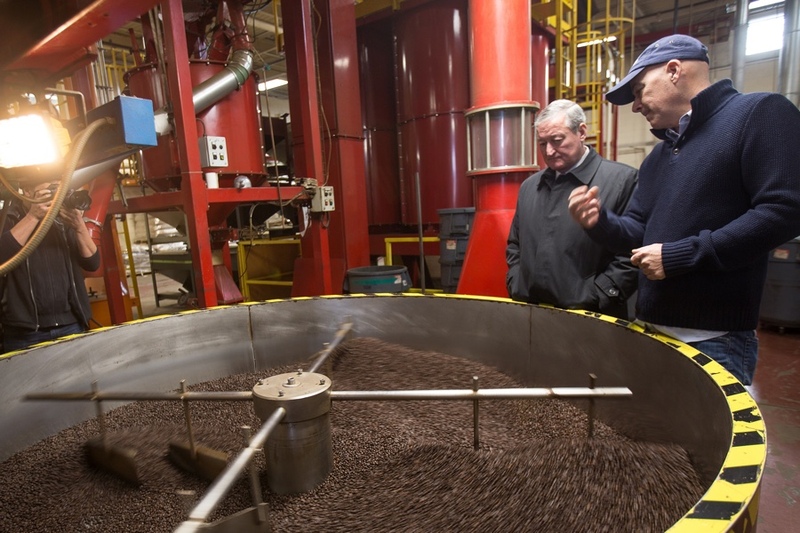 Philadelphia eagerly submitted its bid for Amazon’s second headquarters back in October, and, since then, the mayor’s schedule has been peppered with visits to local businesses as part of a Philadelphia Delivers tour. 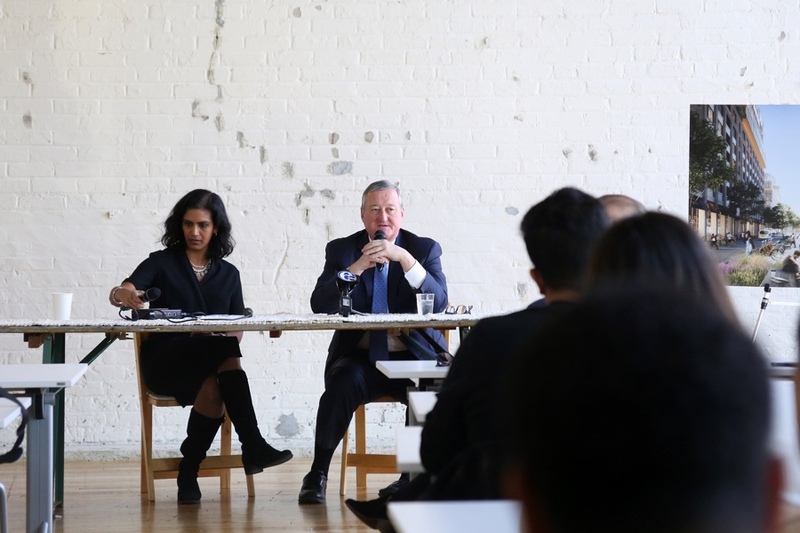 Kenney has popped into spaces like WeWork, the Navy Yard, and Vanguard’s Center City Innovation Studio to keep the dialogue with Philly businesses open. According to Kenney, the tour has been eye opening, as businesses haven’t complained about Philly’s tax environment. According to Kenney, there’s a definitive split in the business community between the new and the old. And he’s got a strong message for organizations that fall into the old camp. As we close out 2017, Kenney shares his thoughts on Philly tech, diversity, and his priorities for 2018 as they relate to Philly businesses. BizPhilly: We’re a few months out from the day the city submitted its bid to Amazon. What did you learn about the business community during the effort? Kenney: The process was partly about coalescing every element of the city and the business community, including labor and elected officials and others in the region to attack the Amazon response. We realized that in addition to trying to get Amazon we have a rich, deep, interesting and diverse business community. Throughout the process the focus wasn’t on just the Chamber of Commerce, for example, but on all other startups, tech businesses and the innovation community at large. We wanted to make sure we showed them a little love. Whether we get Amazon or not, a lot of the positive fallout from the effort was recognizing what our assets really are in order to appreciate and then nurture them. 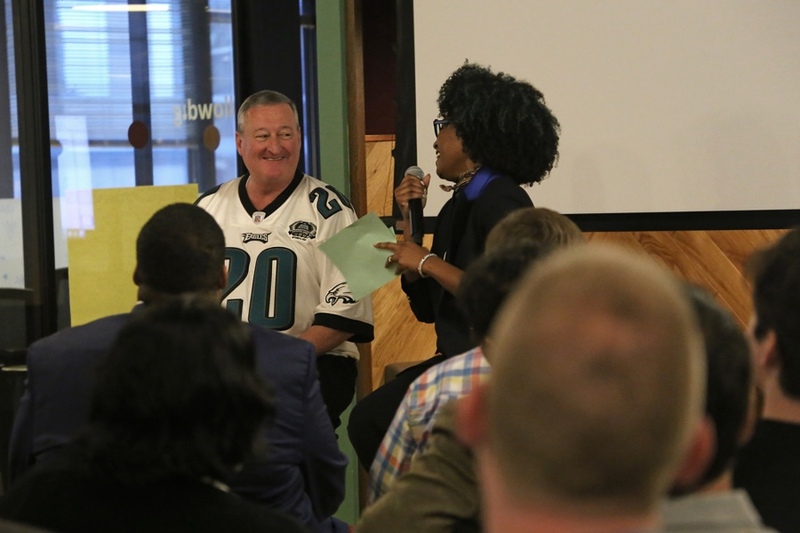 Kenney with Skai Blue Media founder and CEO Rakia Reynolds at Philadelphia Delivers kick-off event at WeWork. BizPhilly: Since submitting the bid, you’ve been on a Philadelphia Delivers tour, your attempt to keep the momentum going. What’s something you’ve taken away from the businesses you’ve met with so far? Kenney: I will tell you that of all the places we’ve been on this listening tour, no one talks about taxes. BizPhilly: Why do you think that is? Kenney: Because it’s not that expensive to be here. The traditional Chamber of Commerce talks about taxes, wage taxes — the same mantra. But with the newer businesses — the people have come in with startups — taxes aren’t even discussed. They talk about education. They talk about innovation. They talk about access to government and about streamlining regulations. They talk about workforce development and wage equity. But they never talk about the tax rate. They’re a very progressive group. BizPhilly: It sounds like you’re identifying some kind of split. How would you explain the difference in this progressive group you speak of? Kenney: I think age. Life experience. They are a very interesting, vibrant group. For example, let’s take the sit-down at the Vanguard Innovation Studio. We were in a conference room, and it was a multi-generational, diverse group of people. We talked about education probably eighty percent of the time. And that’s why we’re attacking that with PHL Pre-K, community schools, and our Rebuild program. They’re very enthusiastic. They were not anti-beverage tax. They didn’t say, “Oh my, this beverage tax or wage tax.” We’ve been reducing the business and wage tax since 1998 every single year. So the old bugaboo that it is a high tax environment doesn’t resonate with them. BizPhilly: And for the traditional group of businesses you speak of, why do you think they’re stuck on talking about taxes? Kenney: They’re used to what they’re used to. They’re used to doing things the way they’ve always done them. They’re used to complaining about the things they’ve always complained about. And they don’t see the forest through the trees. Wage tax, business tax, real estate taxes — no one wants to pay these taxes but everybody wants services. It’s like the state legislature. They don’t want to raise taxes ever, so they’ll expand gaming, which is a tax on old and poor people. The PIT, the personal income tax, is the most progressive and fair tax there is because the more you make the more you pay. That’s why this federal tax change is going to be a disaster because they wrapped it around middle class values but in the end, the one percenters are going to benefit. When I look at our sports teams for example, I find them to be more progressive than the traditional businesses in our city. I think what the Sixers are doing, what the Phillies have always done, what the Eagles do, what the Flyers do with Snider Hockey — and it’s in their interest because they’re generating a fan base — but they’re also giving back. I wish the traditional businesses in the city would do the same, like people in the financial sector and banking. I can’t say the same about the legal community because they’ve stepped up unbelievably in this immigration crisis. I never thought I’d say I love lawyers now, but I do. They’re the wall between dictatorship and democracy. BizPhilly: So what do you say to critics who claim that Amazon isn’t even considering Philadelphia because of anti-business elements like its wage tax? Kenney: We are 23 percent cheaper than Boston, New York and Washington, D.C. in cost of living, rents, mortgage, restaurants, you name it. Although we have a wage tax that started back with Frank Rizzo, we’ve been reducing it since Ed Rendell and we’ll continue to reduce it. We’re also the largest growing millennial city in the country percentage wise. Our educational and medical institutions are iconic. We have a great public transportation system. This is a walkable city. An affordable city. A cultural city. A diverse city. And again, whether Amazon picks us or not, I’m still proud of us. And we have our rough edges, like resistance to change, resistance to diversity, and some segments of our population are resistant to immigration, but I think our rough edges are changing. BizPhilly: A number of people I’ve talked to are concerned that Philly might be among those cities willing to give Amazon the keys to City Hall through ridiculous incentive packages. What’s your response to that? Kenney: That’s the traditional Philadelphia attitude, and that’s what we have to break. 50,000 jobs over 15 years is not a problem. That’s a manageable, wonderful thing where we can prepare our three -and four-year-old babies right now in pre-K. Get them through an elementary school experience, a great high school experience, and get them into college. And when they graduate, they’re able to take that job making $80,000 a year. And there’s nothing wrong with that. People talk about rents going up and congestion and parking, but these are manageable problems. Too many people think about the negative and not about the positive. Change is not a bad thing; managing change is what our responsibility is. There’s change that needs to happen in order to progress. When you have a company like Amazon or Comcast or American Express, they’re a force. And you need to make accommodations sometimes because the competition is so big. It’s like a beauty contest. You’re going to have to put your best foot forward, and if you don’t, you won’t get it. But if you could imagine Amazon choosing Schuylkill Yards near the 30th Street station with Drexel and Penn, that’s like, how could you not get excited about that? And they can go to Boston. And they can go to New York and Atlanta. So if you don’t offer anything, you’re not going to get anything. BizPhilly: So in your mind, when it comes to wooing a company like Amazon, is there anything that you’d say definitely crosses the line? Kenney: That’s kind of unknown at this point. You could extrapolate to the ridiculous. We’re talking within the confines of our ability to offer KOZs or KIZs or tax abatement or TIFs or tax consideration. It’s like with the tax abatement. People say, “It’s not fair that I have pay my real estate taxes but this rich person doesn’t have to.” They call it the Chase Utley argument. Chase Utley, when he was playing with the Phillies, moved into a multi-million dollar condo in Liberty Two and people said he didn’t deserve tax abatement because he can afford to pay his taxes. Well, he can also afford to live in Radnor, or Cherry Hill, or Voorhees, or wherever. When you live in a city that has a 26 percent poverty rate, I need all the rich people I can get. That rich family will pay wage taxes, dine at restaurants, shop in town, and contribute to the economy in many ways. And after ten years, they’re paying real estate taxes. If you’re a person living in a neighborhood and you’ve lived there generationally and you’re paying real estate taxes and your assessment has gone up because your neighborhood is gentrifying, I get it. I understand your argument. But you have the LOOP. You have the senior citizen tax freeze. You have homestead exemption. These are things that you have, too. But the point is if we don’t continue to be attractive financially and otherwise, then we’re going to be stagnant. 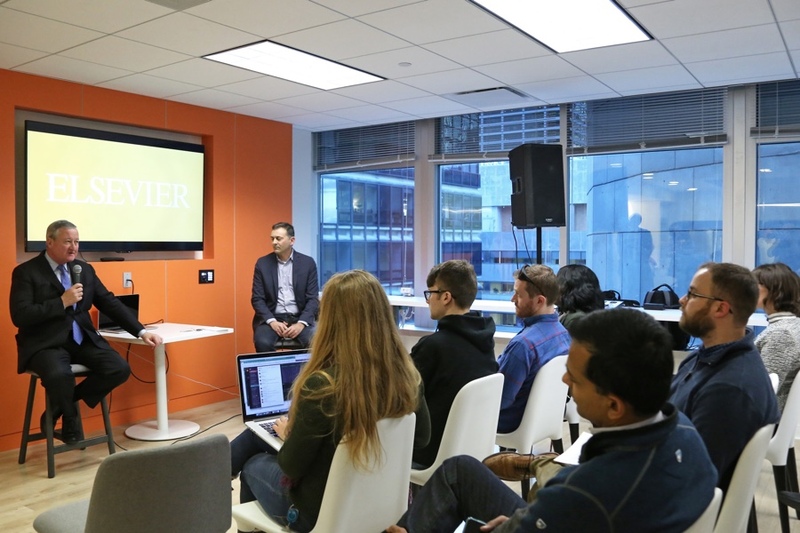 Mayor Kenney at Elsevier as part of his Philadelphia Delivers tour. BizPhilly: Philly still has a reputation for being anti-business. Look at how things have gone down with the beverage tax this year. How do you respond to the anti-business criticism now? Kenney: I don’t understand. I mean Council will do some things that the business community doesn’t like, but it’s the business community’s responsibility to have a lobbying effort and a relationship-building effort that allows them to have the same access that labor does, that the construction trades do, that the service unions do, that the police and fire unions do. You have to work at it and sometimes I don’t think they work at it. And then something happens and then it is, “That’s horrible. You’re anti-business.” I don’t think women’s pay equity is anti-business. I think it’s pro-people and pro-equity and pro-fairness. That’s the stuff they get hung up on. BizPhilly: Of the businesses you’ve visited so far, what asks did they make of you? Kenney: A lot of people offered their help. They want to know how they can volunteer, how they can be more productive citizens in the city and have their employees be part of the fabric of the city. And they can do that by volunteering in schools, libraries, and recreation centers. Get your whole company together and go out and do a paint day or a library fix-up day or clean up day. Millennials get this kind of reputation of being self centered and self absorbed. I don’t think that’s the case with them at all. I think they want to be contributors to society, not only in the business community but also socially. And again, with the businesses I visited, they weren’t sitting there with their arms folded across their chests complaining about something. They’re open and saying look we are working on our own things, but how can we help? How can you help us and how can we help you. And that to me is very energizing that I can reach out to a company or group of companies and say we need this help for our kids in pre-K.
BizPhilly: I’d like to pivot to talk about tech, in particular. It’s an industry with a lot of promise for Philadelphia, especially with the amount of jobs it’s expected to bring here in the next decade. Kenney: Yes, and it’s an industry that’s very white. I went to SXSW and it was somewhat Asian, but overall it was really white. BizPhilly: Yes, following SXSW, you spoke about your outrage on this and suggested that Philadelphia launch its own conference. Do you have more to say about that? 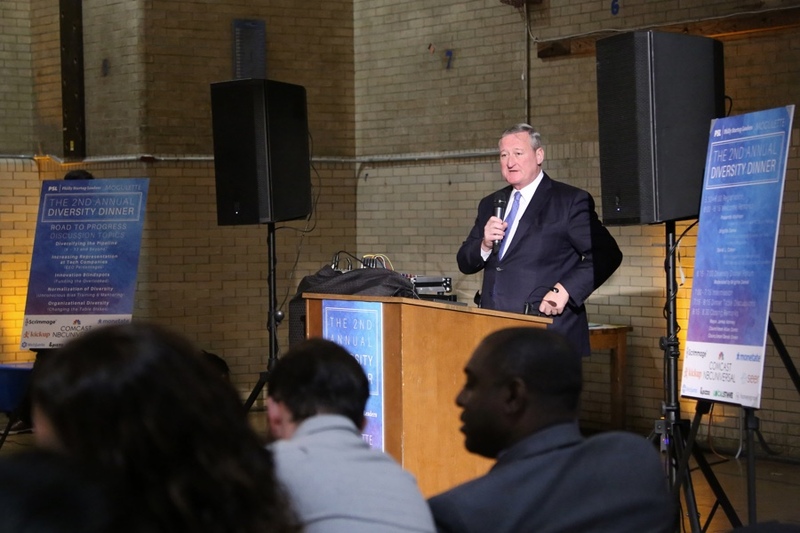 Kenney: Yeah, this year I also went to the BEYA STEM Conference in Washington, D.C. It was a STEM conference for historically black colleges, and I remember watching as people streamed off buses and I was the minority. There were very few white people, which is not what you’re used to in this country. Mostly it’s either mixed or overly white. This was a hefty bunch of people. They were wealthy business owners and admirals and generals of color. I was so impressed with that conference because of the lack of white diversity there and the strength of the people in attendance and we’re going to do that in Philly. We’re going to do the North Star conference. BizPhilly: Can you say more about your vision for the conference? Kenney: The name of conference comes from Frederick Douglas’s newspaper. The whole concept of the North Star was explaining or giving black slaves the ability to move toward the North or Canada and get free. I think this is an economic freedom effort. It’ll be targeted toward people of color. The Black and Brown Founders tech group will help us organize and run it. And it will start out probably relatively small. 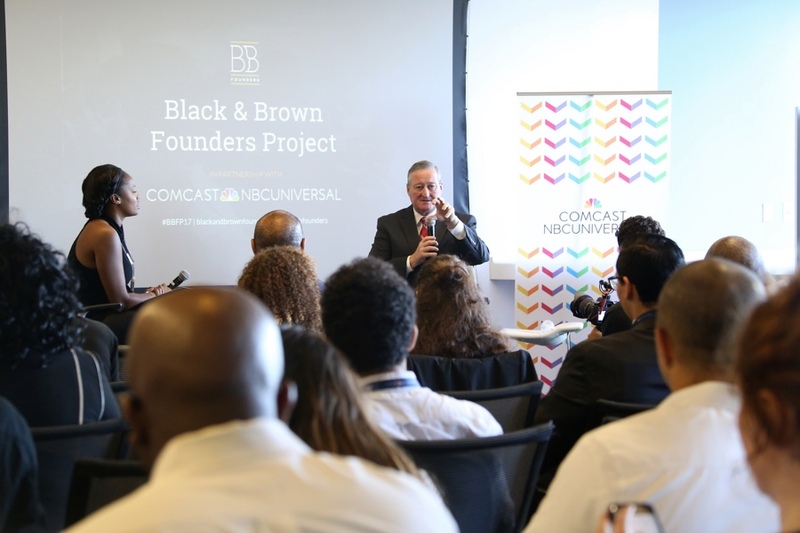 We want to grow it to be the annual thing that really makes Philadelphia a place for black and brown entrepreneurial efforts. Atlanta, through Morehouse and Spellman, for example, became a hub of innovation and diversity. I would like Philadelphia to have that same reputation in the North. I think it could be a game changer for us. But more importantly for me, that child who is in a quality pre-K program now at three or four years of age, goes into kindergarten, first grade, eighth grade, college, if we get an Amazon or similar company like that, they’ll be able to take that job. They’ll be skilled and ready to take the 80 to $100,000 a year job. And I won’t have to worry about incarceration or opioid addiction. I won’t have Emerald Street under the bridge or 6,800 people incarcerated at State Road. All those things kind of dissipate when people are working and being productive. I might see the change when I’m 80. I hope I’m around to see the change, but the seeds we’re sowing now will be the change the city always needed. BizPhilly: The tech community hit a couple of rough patches this year when it came to diversity and the community is trying to pick up the pieces with changes to organizations like Philly Startup Leaders. Do you think government has a role to play here in terms of policy to make sure local startups continue to move along on diversity efforts? Kenney: I think government’s role sometimes is to push and sometimes you get out of the way. There’s a balance that you have to find. I think the Mayor’s office and government talking about the disparity is important because it brings attention to it. And then it generates conversation on how we fix it. We definitely need a more diverse Chamber, a more diverse tech and startup community. Despite what Trump says about manufacturing and clean coal, that stuff is old bull. It’s not coming back. No one is moving their factories making toys from China or Vietnam or moving their clothing manufacturing from Singapore back. The next 30 to 50 years is going to be tech and innovation. If we don’t prepare our kids for that we’ll be at a 26 percent poverty rate for the rest of our existence. BizPhilly: What are your priorities for 2018 as they relate to the business community? Kenney: We’ll be trying to continue to reduce the taxation burden on businesses, within reason. And explaining to them why it’s important for them to be more integrated into the social fabric of the city. A lot of the people who run these businesses don’t live in the city so there’s this disconnect. I’d also like to make businesses understand that reentry is critical to our city’s future and that pre-K, Rebuild and community schools are also critical. I’ll also continue to emphasize that diversity is strength.